Today is Dashami, the day when the biggest Bengali festival, Durga puja comes to an end. Unlike other days of puja starting on a joyous note, planning and preparing for the pandal hoppings and night outs Dashami starts on a somber mood. The morning begins with preparation of biding good bye to the ‘gharer meye’ the godess Durga with a heavy heart. 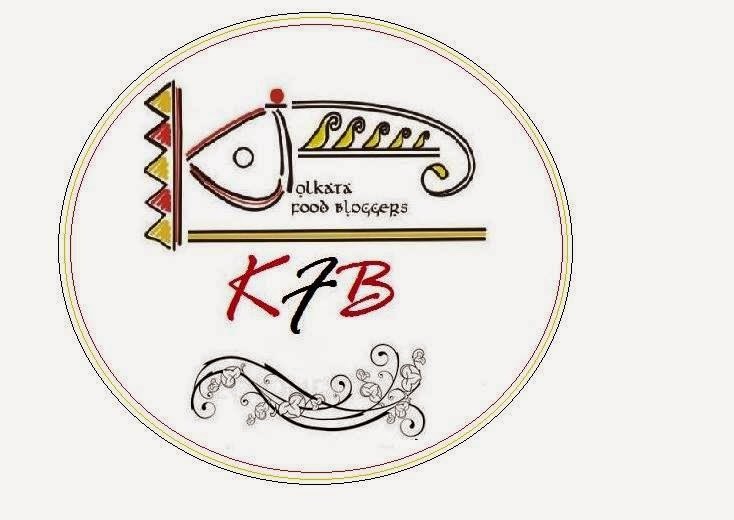 We offer her sweets, pan (betel leaf), Sindoor and wish her a safe journey with the kids. And then we touch the feets of our elders and seek their blessings. This is one tradition that we hold very close to our hearts. Puja for all Bengalis is a time to be home. Wherever we are we make it a point to visit home and spend the puja with entire family. That is the very essence of this festival, spending these few days with close ones and creating memories for the whole year. ask any Bengali what he or she is doing during puja the probable answer would be ‘bari jachi’ (going home). This small vacation gives a new leash of life to all Bengalis. Once the celebration is over we pack our bags, travel back and face the world all rejuvenated. For us Bengalis its like the start of a new year, a new season with more confidence and feel good factor. This year am away from home and honestly am happy that am not cought in the frenzy this time. The last 2-3 months have been very hectic for me. Mentally and physically it has drained out the last bit of energy. So right now am enjoying this little time of solitude in a service apartment. All am doing now is making dinner and having long walks in the picturesque Tokyo and its parks with my little one. But today being Dashomi something sweet needed to be made and I literally have very few options. So Rava laddoo it is with homemade instant khoya from milk powder and butter instead of ghee. I hardly had any expectation from this sweet but surprisingly this tastes amazing. Just like the real thing, slightly crunchy and melting in the mouth. Dry roast the semolina on low flame for 8-10 minutes till they are crisp and lightly golden. Add 2 tbsp of butter or ghee to it. Mix and stir for another couple of minutes. Set aside. In the same pan place the milk and the rest of the butter and on medim flame bring it to a boil. Add the milk powder and cardamom powder and mix well. The milk powder solidifies very soon so better be quick and mix vigorously. Do this for a minute and it will start to leave the sides. Add in the sugar, mix and cook for another minute. Finally mix in the semolina and chopped raisins mix everything together. Cook this by stirring continuously for 2-3 minutes. Switch off and let it cool down a bit. Once its easy to handle (should be warm or wuld not come together in a ball shape) take a handful and press between palms to make small round balls. Place a raisin on top and serve. you can also use chopped and fried cashews or almonds in it. I dint have access to this. Saffron instead of cardamom would be nice as it will provide a nice golden color to it. Be very careful while roasting the semolina. always do it on low flame or you might end up with brown bits of burn semolina. Add more warm mil 1 tbsp at a time if it does not come together. Celebrate Navaratri/ Diwali. 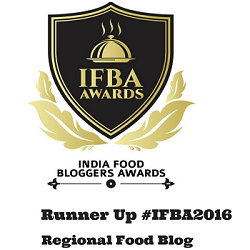 Event conceptualised by Jagruti and this month hosted at Simply food. 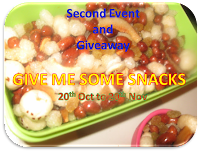 Priyaavasu's Navaratri 2012 event and giveaway. Diwali bash at cooks Joy. 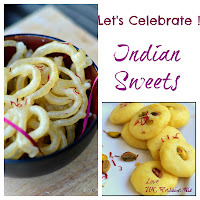 Come Celebrate Indian sweets at UK rasoi. Give me some snacks at Pari cash kitchen. My Diwali basket at cook-eat-burp. 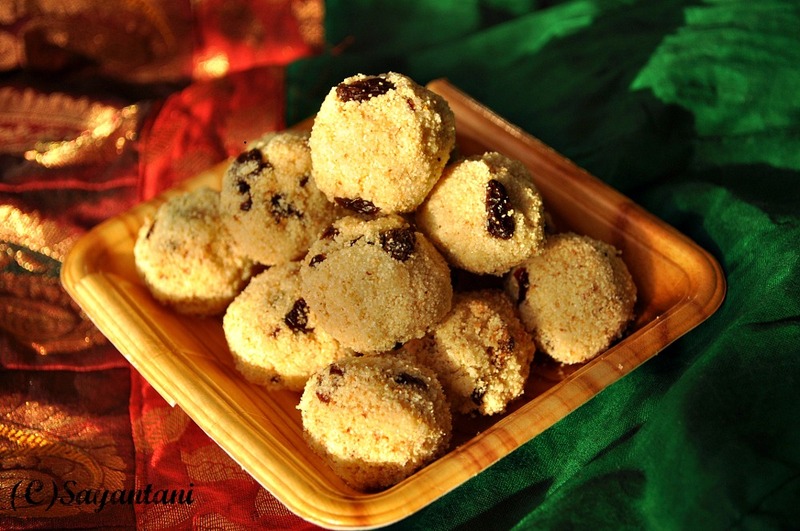 laddoo recipe, coconut laddu, rawa laddoo, rava laddu recipe, besan laddu, diwali recipe, sweets for diwali, diwali sweet recipe, diwali sweets recipes, easy rava laddu recipe, how to make khoya at home, instant khoya recipe, milk powder khoya recipe, mawa rava laddu, mawa rawa laddoo recipe, semoline dessert recipe, indian sweet semolina ball, semoline sweet for diwali, semolina recipes. Beautiful laddoos to celebrate a beautiful festival!! Shubho Bijoya to you and your family Sayantani!! Hi Sayantani, Shubho Bijoya to you! !these ladus' are loved in my family. We make it with sugar syrup though. I am sure the milk powder has given it a good body. Enjoy your time in Tokyo and post loads of pictures for us. I am conjuring up all the energy after a bout of migraine and making Pakatya Purya(traditional marathi recipe of puri soaked in syrup, however plan to resurrect it). Lovely! And that's you, creating a yummy treat with what's available. Cheers! Shubho Bijoya! Happy dusshera wishes to you..
Rava laddoos looks super attractive and beautifully done. 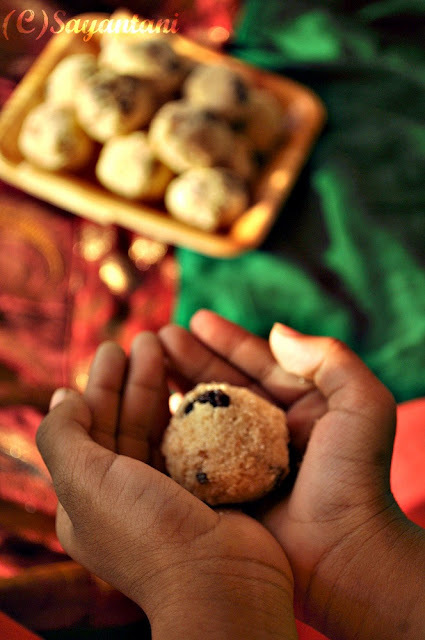 Delicious Ladoos, i make them by adding Ghee. Thanks for sharing!!! They look crunchy and wonderful ...happy dashami..
Shubho Bijaya to you and your family! How I wish I had some of these right now. Shob shomaye nijeke kore khete bhalo lage na...aar ekhane dokane kinteo para jane na. I guess i have no other choice but to make them myself! Shubho Bijaya to you and to your family. Loved these delicious laddoos and such a lovely way to celebrate the festivity. Hope you are enjoying Tokyo !! A very nice presentation and photography Sayantani.Tomakeo janai Shubho Bijoya. Inviting ladoos and nice clicks. As usual, more than the ladoos, I love the little hands. Shubo Bijaya to you and your family. Oooh!! So festive!! 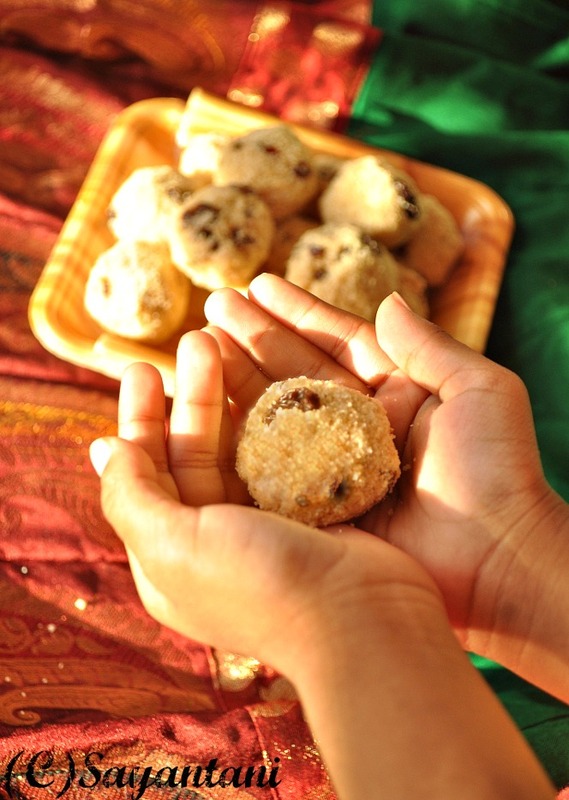 Love the concept of the hands holding the laddoos! i love besan and rava laddoos :) Shubho Bijoya to you and your family Sayantani! Enjoy your solitude Sayantani..and take care. 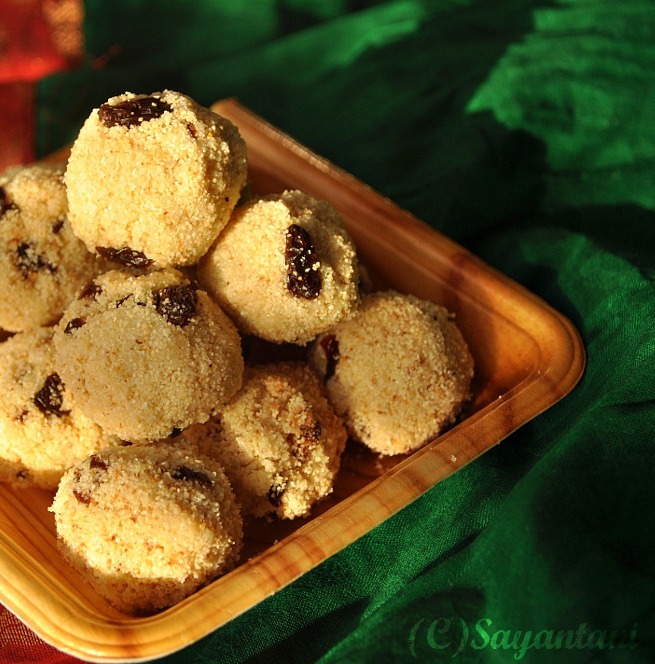 These rawa laddoos is one recipe which binds India from Kashmir to Kanyakumari! Common, versatile and tasty. Dear Sayantani , love this post. Ladoo looks very delicious and divine. Enjoy Tokyo. Wish you guys come and live in US too.... Happy pooja. first time here. 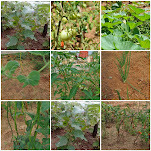 do visit my space pl. Nice laddoos and I love the clicks, especially the one with holding the laddoos in hands. Have a nice stay in Tokyo! 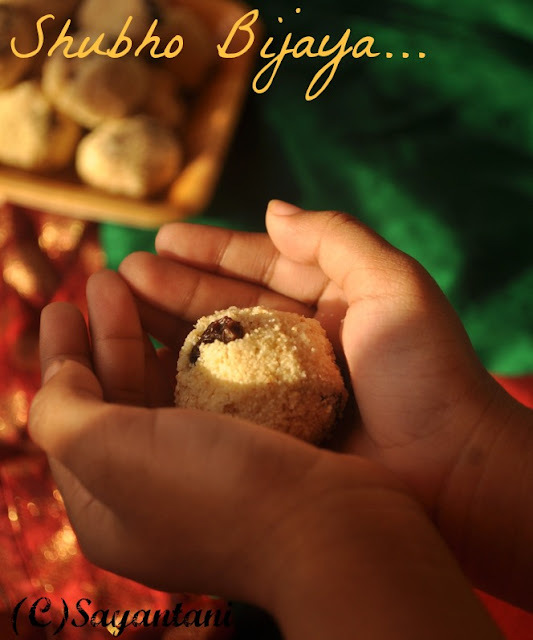 Fantastic laddoo recipe, looks yummy. As always, lovely clicks! when i added milk powder to the milk and ghee mix it gets solidified so i crumbled with da spatula as a result da mixture remained powdery nt a dough like. Then i mixed sugar, rava and nuts after 2mins switched off. But when i went to make ladoos afet 7-8mins i cudnt make da balls. Plz tell me what went wrong? Btw happy diwali in advance. @Anon, so sorry that your laddu mixture dint hold well. First thing tthat I can think f is waiting for 7-8 minutes is too long a time to wait before making balls. thats a long time for the semolina to soak all the liquid. also you do not have to switch off before adding the sugar. the idea here was to melt the sugar in the heat and get a syrup kind of texture, switching off will definitely lower the heat in the milk mixture and will not melt the sugar. am really not sure about why the milk powder solidified so soon. because the heat in the pan melts it too all you have to do is stir it or lumps form. hope you added right quantity of milk (4 tbsp which is 1/4 cup; which i just updated)with a right sized measuring spoon. for reference 1 tbsp=3 tsp. Also the milk powder quality might vary (I used nestle everyday). sorry again that it dint worked out for you. next time if you make it try adding more milk 1 tsp at a time to reach the right consistency. thnks for your prompt response. regarding milk and ghee mixture I hd added 1/4cup of milk for sure bt then added da milk powder(I used nestle everyday too) at one go. So,jst tell me how da mixture will look like? Dough or liquid or powdery consistency? ThereAfter when i put sugar should da sugar melt? Then only i put da rava and nuts? Sorry for bothering you bt i really wanna help myself . Thanx again in advance. @Anon. no problem. once you add the ghee and milk powder and mix it, there should be a cake batter type consistency. do not cook it much add the sugar then and mix. I used castor sugar and will melt within a minute. once you see small bubbles start to appear on the sides add the rava and mix quickly. keep the heat low at this point so that the rava abosrbs the moisture and become soft. another thing that I can think of is if you are using grainy kind of rava. the rava I used is very fine. if that is so then try dry grinding it in your food processor. also if nothing else work then add more milk as suggested in the notes. also I dont know what you did with the hardened rawa mixture. trying soaking it in warm water and then cook Mohonbhog as suggested here.